Butterfly weed is a kind of milkweed. The brightly colored, orange flowers are similar in shape to those of common milkweed. It is a native perennial that gets its name from the fact that the flowers are so attractive to butterflies. Insects and hummingbirds are attracted to both the color and the large amount of nectar produced by the flowers. The leaves of this plant are long and narrow; they protrude from the hairy stem in an alternate, circular arrangement. You will find butterfly weed growing in full-sun locations in dry-soil conditions, not unlike those you would find along roadsides. Other names for this plant include Orange Milkweed, Butterfly Love, and Pleurisy Root. 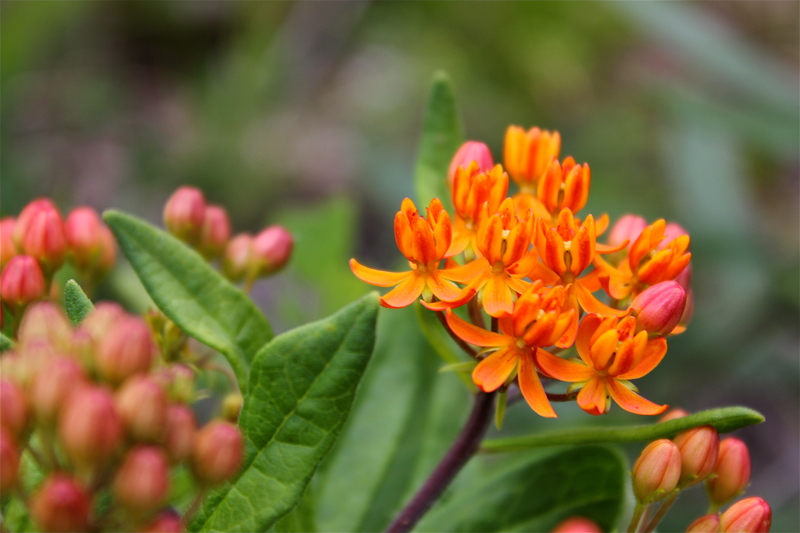 Like other milkweeds, butterfly weed is a host plant for the larvae of the Monarch butterfly. The caterpillars, which feed exclusively on milkweed plants, incorporate a toxin from the plant that deters bird predators. The plant was also used medicinally by early colonists for the treatment of pleurisy.